1001 Spikes is certainly not a bad game, but it doesn’t seem particularly interested in trying to be more than it’s competition. It’s like a race car driver that is perfectly fine coming in fourth place every race, and never doing anything to come in third, second, or even first. Perhaps that’s worse than if it was just bad. 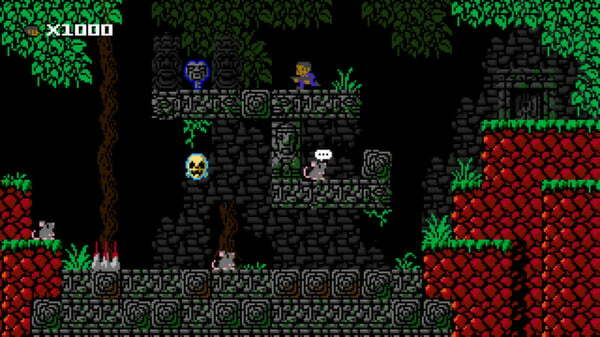 What does one expect from an indie-developed, 8-bit styled platformer anymore? At one point in time, the idea was novel and was certainly something to feel nostalgic about, and for many, that still may be the case. I know I wasn’t serious about gaming until the PlayStation era (though I owned the SNES, Nintendo 64, and several Gameboys before that), so the idea of playing a NES-style platformer on my PlayStation 4 doesn’t necessarily elicit feelings of nostalgia, but a different emotion altogether. You see, I’m frustrated by the terms 8-bit (or 16-bit) and indie being synonymous. Attempts to cash in on gamers’ nostalgia (and, oh, isn’t there plenty of that!) has gone from feeling like “oh boy, neat-o!” to “oh boy, again?” That, of course, isn’t to say that the indie scene is screwed or completely devoid of originality, because it isn’t! There is an incredible opportunity for independent developers to utilize inexpensive engines and produce high-quality games with great production value. The idea of 8 or 16-bit feels cheap at this point when the indie world is more powerful than ever, thanks to likes of ID@Xbox and Sony’s efforts to get as many indies on their consoles. And this feels like an incredibly negative way to start a review for a game that is otherwise pretty fun, but 1001 Spikes is yet another indie-developed, 8-bit-styled platformer that’s brutally difficult and despite the game’s greatest efforts, it fails to stand out from the rest of the pack. 1001 Spikes certainly fits the bill for an 8-bit throwback, but it doesn’t do anything to differentiate itself. Right from the bat, it’s clear that the developers have a keen eye for the beauty that comes from the NES-era. The graphics are blocky and the characters are simple. There’s an unremarkable, but definitely cool, soundtrack that feels especially late-80s, early-90s. While that’s tough to fault a game for – because, really, who doesn’t like the look of these graphics? – it doesn’t nothing particularly interesting with them. Perhaps a more modern flare here or there would’ve livened up the screen a bit. For better or worse, 1001 Spikes doesn’t really look much different than any NES game or modern imitators. 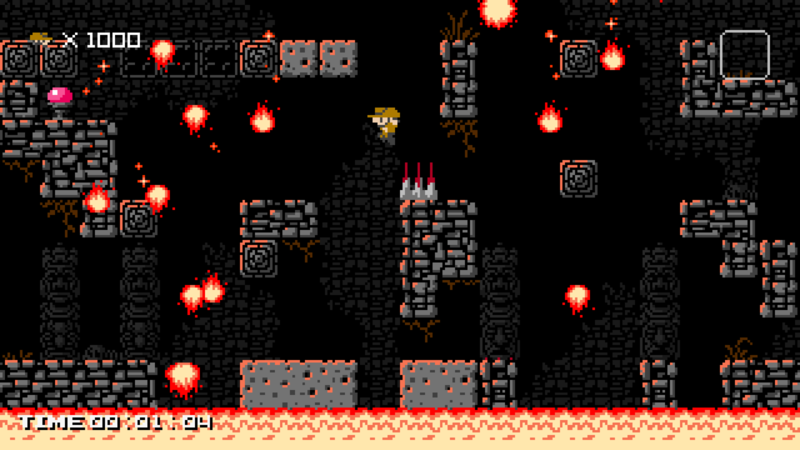 1001 Spikes is difficult, but rarely does it feel frustrating. There aren’t any levels that provide an ungodly jump in difficulty that so often appears in games that are meant to be difficult. The flow from stage to stage feels natural, and as a player, you grow to learn what to look out for in the design of each level. Some blocks shoot arrows when you’re in front of them, so it becomes clear pretty quickly that you’ll need to jump and you learn to identify these blocks before they manage to shoot. There are also spikes that protrude from the ground, or bricks that fall, or break… And thanks to solid level design, you know before going into each level what to look out for and how to respond without the game ever blatantly telling you to do so. This is something that generally needs to be in a 2D platformer of this sort, so that there isn’t time for the game to stop you and allow you to grow bored with reading tutorials. 1001 Spikes does this remarkably well. This extends beyond just the jumping and moving. The controls are spot on and allow for some extremely tight platforming that feel as spot on as many of the classics do, like Mega Man and Super Metroid. It doesn’t take long to understand concepts like just how far can the character go before falling off of an edge? Or just how quickly does one drop after falling off of an edge? It’s well-made and well-crafted ideas like these that really make 1001 Spikes a solid entry in an otherwise crowded marketplace. If you’re looking for a nostalgia-driven experience, then you could certainly do worse than 1001 Spikes. But if you’re looking for an interesting game that really pushes the indie scene in a positive direction, rather than keeping it firmly afloat as a concept that’ll rarely bring in newcomers, then maybe 1001 Spikes isn’t for you. I’m not sure it was for me. 1001 Spikes is so safe that it actually detracts from the experience more than if it had simply been a bad game, which it is not. It's difficult without ever being particularly frustrating, and that certainly helps in forging a solid experience.